The seafood industry in New Zealand has asked the government to withhold graphic video of dead sea life caught in trawler nets as they are potentially damaging to fisheries and to brand New Zealand. A letter from five seafood industry leaders to the Ministry of Primary Industries highlights the fisheries’ growing unease with the government’s proposal to install video cameras on all commercial fishing vessels to monitor bycatch of other species and illegal fish dumping. The letter requests an amendment to the Fisheries Act, so video captured onboard cannot be released to the general public through a freedom of information request, frequently used by the media, campaign groups and opposition parties. “They [the proposed videos] also raise significant risks for MPI and for ‘New Zealand Inc’,” the letter reads, also citing concerns about invading the privacy of employees onboard, and protecting commercial and trade secrets. ​There are no reliable figures on the numbers of penguins, sea lions, dolphins and seals that die in fishing nets or longlines in New Zealand, but according to some researchers and environmental groups the commercial fishing industry is the main culprit for declining populations of endangered sea lions and yellow-eyed penguins. Only 25% of deepwater trawlers in New Zealand have government observers onboard to record bycatch and discards, according to the National Institute of Water and Atmospheric Research [Niwa], which relies on statistical modelling techniques to generate bycatch estimates for the 75% of boats that work unobserved. Niwa estimates for every kilogram of reported target catch (what the fishing boat aims to catch ) there is 0.2 kg of bycatch. 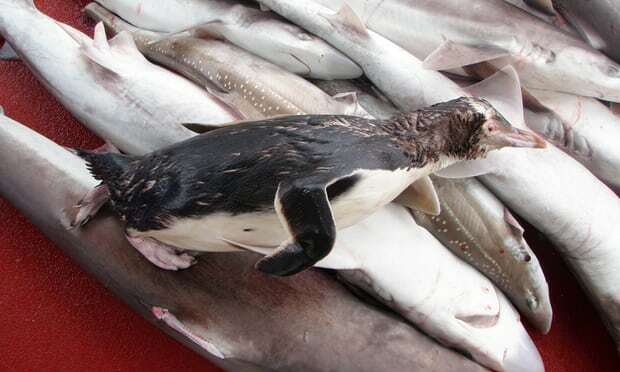 “These are the images the fishing industry doesn’t want you to see,” said Forest & Bird’s chief executive Kevin Hague. Deepwater fishing vessels account for 80% of New Zealand’s annual catch and earn NZ$650m per annum in export dollars. Stuart Anderson, director of fisheries management for MPI, said no decision had been made regarding the seafood industry’s proposed changes to what information the government should release about their practices at sea. “There are many elements to consider carefully in balancing the responsibilities of transparency and public interest while protecting privacy and other sensitive information” Anderson said.